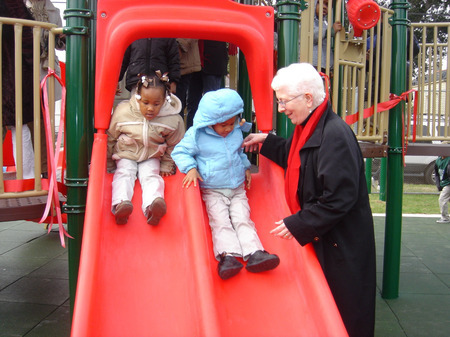 Dr. Barbara Barlow, the Founder and Executive Director of the Injury Free Coalition for Kids® helps young people make their way down a newly built slide in Lyons Park. The newly built “Little Hands” playground is designed to provide a “Safe Place” for young people to play. 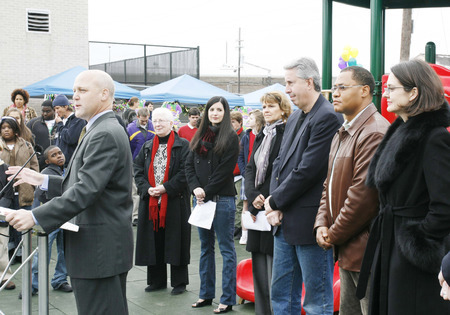 Representatives from the Injury Free Coalition for Kids, the Allstate Foundation, Operation Kids, the Drew Brees Foundation, the New Orleans Recreation Department, the City of New Orleans, the State of Louisiana, and the Faubourg Delachaise Neighborhood Association celebrate the first of 5 playgrounds to be built in New Orleans during the next 3 years. Click HERE to see the new Community Advisory for the Harrell Park Playground. In addition to reducing injuries by providing Safe Places for children to play, the Injury Free Coalition for Kids community building process is designed to invigorate community spirit and revitalize the neighborhood leaving a safe and vital community which emphasize tolerance, inclusion, diversity and economic empowerment. Residents interested building a playground in their neighborhood should continue to check the website for information on opportunities to compete for a Little Hands playground grant.